I hate you Cannes Lions Festival of Creativity, I hate you. You’re like that dream that feels so real and fills the dreamer with hope. Until the poor chap wakes up. You’re like that video of Ryan Reynolds and Blake Lively setting couple goals that I really shouldn’t have clicked on. But now I have and I can’t stop feeling this angst and self-loathing. I hate you Cannes Lions Festival of Creativity. Why did you come into my life? This rant may seem a little over the top, unless you, like me, have felt tortured by the disparaging temptress that is this glorious festival. This year was my second year at Cannes and also my second year representing India at the Young Lions Print competition along with my Art partner Nishad. And to all those who joyouslyencouraged me, “Go to Cannes, Mithila… It’ll be so amazing, Mithila…it’s great exposure, networking, beaches, rosé” etc., I just want to say one thing – what were you thinking? The painful simplicity of all the work that took center stage. It started with the Young Lions Print competition. 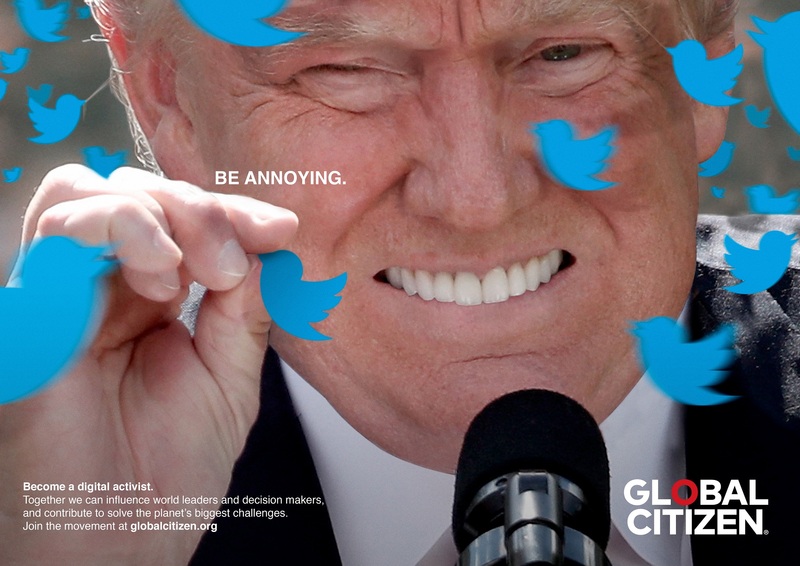 Our brief was to create a print ad in 24 hours that tells people to sign up to be aGlobal Citizen. Global Citizen is a non-profit that stands for a connected world in which we come together, regardless of country, race or religion, to solve global problems. If you sign up, you are asked to take‘actions’, which could range from tweeting to a world leader to joining a petition. It revolves around an immigrant girl in the U.S. and how her story goes from Portugal to Turkey to China and connects back to America. 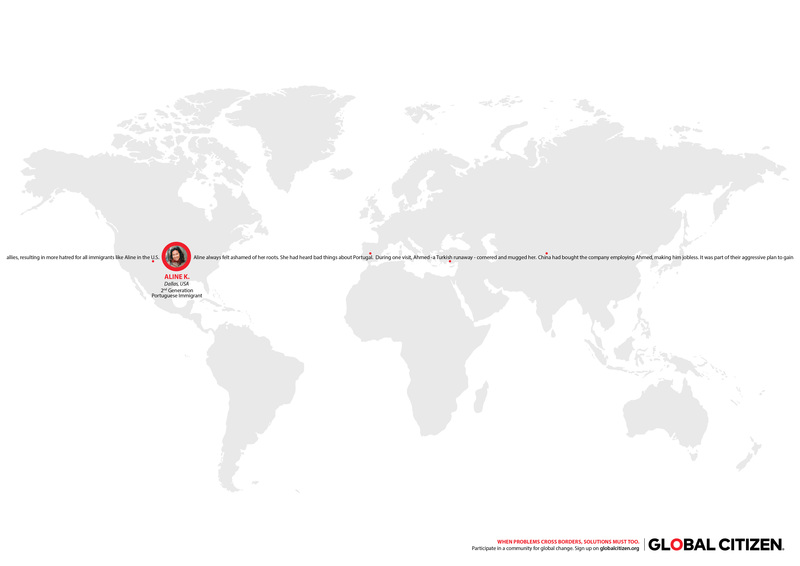 The copy travels across the map, with each country’s name coinciding with its spot in the world, to signify the way our problems travel too. We thought the ad was insightful, clever, catchy and to the brief – the ideal combination for a win, right? Do you feel like you were just slapped in the face? Cause I did. Slapped by the sheer singularity of thought and boldness of execution. And then I saw the same thing happening all week over and over again. Take any of the shining campaigns – Twitter’s Hash Tag, Burger King’s Burning Stores, McCann’s Fearless Girl or Channel 4’s We Are the Superhumans. At the core of them all is such simple, pure and sharp thinking. Which is then expressed in the most daring way – an execution you can only get to when you having infallible clarity on your basic idea and intention. And why is this the most remarkable of all the things that I learned at Cannes Lions? Because anybody can do it. When it comes to the tech, the budgets or the big brand names, we can all make excuses for ourselves and say that we don’t have the kind of tools that some do. Of course, some companies and countries have an edge. It’s no coincidence that the U.S. sweeps almost every category every year.Warren Buffet explained this reality to us a long time ago with what he called the ovarian lottery.But simple, clear thinking is free, isn’t it? And guts? Those are free too. Both are accessible to any person, any brand and any agency anywhere. And that’s what’s so painful about this work –the realization that you could have done it too. So, what stopped you? What stopped you? What stopped you? I’ve come back from Cannes with this question and with a very unsettling feeling within me. To everyone who’s asked me about my experience, I’ve said no, Cannes Lions Festival of Creativity was not fun. I think only two kinds of people can enjoy this festival –the first who win lots of Awards or know that their work is at that level and the second who are just numb. And since the former is a minority in India as per the tally, I do feel that most are just numb. Just getting by with arduousbriefs like ‘this ad has to say this, this and also this and a little bit of that’ or busy overthinking and over-intellectualizing this heartfelt profession. And then blaming some mysterious system when their work doesn’t do well. Enough.I really don’twant to be numb anymore. Cannes Lions 2017 has shaken me out of a reverie of sorts. I’ve come back wanting to take this inexplicable, uncomfortable feeling in the pit of my stomach and turn it into something I can be proud of. Something that will be powerful, simply because it will be agonisingly simple.